Remember when flying was glamorous Jump to media player The author of Jet Set tells the BBC how new planes in the late 1950s ushered in a new glamorous age of travel - first for the rich and famous, and then for the rest of us. Inside the US Secret Service Jump to media player Retired US Secret Service Agent Dan Emmett tells the BBC about his years spent protecting three presidents. Mysterious rose led to family discovery Jump to media player When Italian writer Andrea Di Robilant discovered a mysterious rose growing in the woods of a house once owned by his family, he decided to investigate. The result is a new book called Chasing the Rose: An Adventure in the Venetian Countryside. Was a spy the key to Mid-East peace? Jump to media player A new book claims that CIA agent Robert Ames worked to bring Israelis and Palestinians together in the 1970s through his deep understanding of the region and his ability to charm. Unless you're one of the few who can afford a private jet, there's nothing glamorous about flying today. Crowded airports, security threats and tightly packed aircraft are commonplace. 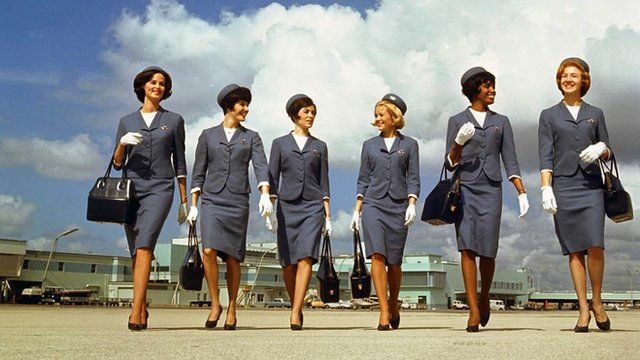 But there was once an era when aviation held enormous appeal for millions of Americans. The introduction of the jet in the late 1950s dramatically cut cross-Atlantic flying times, opening up the world to convenient and cheaper travel for the first time. Leading the charge was the so-called Jet Set - celebrities like Frank Sinatra, Jackie Kennedy and Elizabeth Taylor - who made Europe their playground. But ordinary Americans were climbing aboard the sleek new jetliners as well, ushering in the age of mass tourism. William Stadiem's new book, Jet Set, tells the story of the aviation pioneers who introduced Americans to groundbreaking aircraft like the Boeing 707 and of the people who travelled in their luxurious cabins. Produced for the BBC by Michael Maher.